This is an excellent midweek meal that takes around 15 minutes to make and with few ingredients. 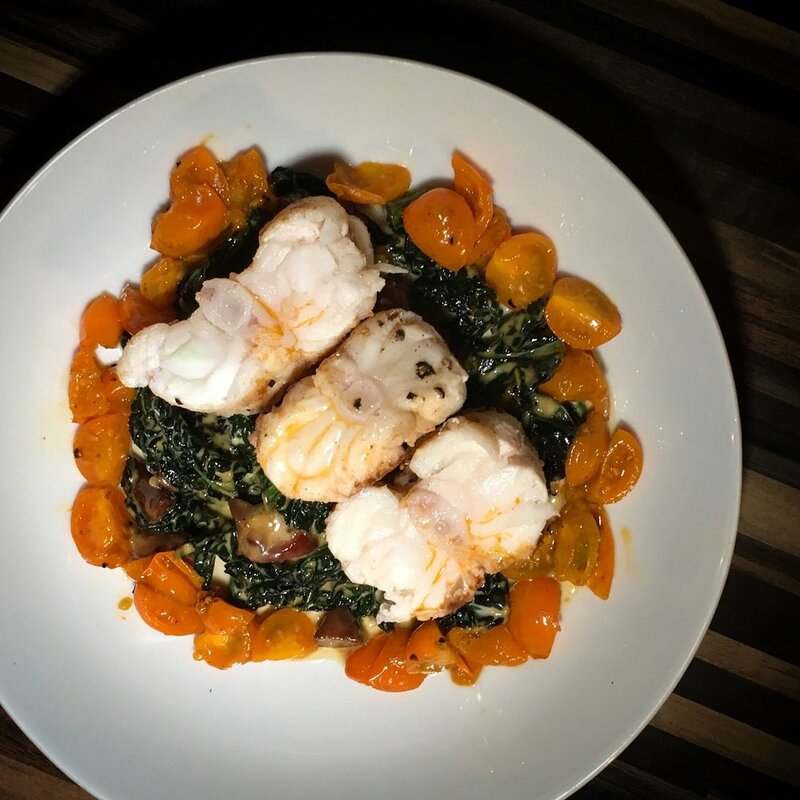 Monkfish is a seriously meaty fish, its robustness in flavour and texture means it doesn't need to be treated delicately. You can cook it aggressively on a searing hot BBQ and throw bold flavours at it without masking its flavour. For the chorizo and kale cream, you can go as heavy or as light on the chorizo as you desire. I only used about an eighth of a ring which was plenty, any more and I feel the dish would be too overpowered. I served with baby 'orange rapture' tomatoes quickly pan fried which added a wonderful sweetness that complemented the fish. Again use as many or as little as you desire. When purchasing the monkfish ensure you ask the fishmonger to remove the membrane completely otherwise the flesh will retract when cooking giving a tough and unpleasant texture. The first step is to have two pans ready as the dish will come together fairly quickly, one for the fish and one for the kale and chorizo. 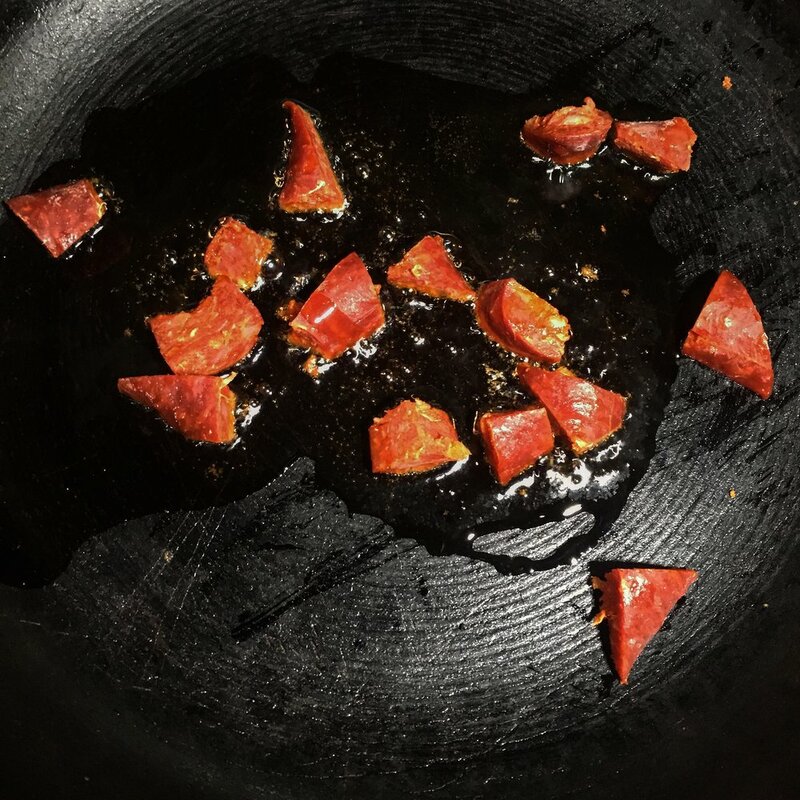 Heat the first pan on high heat with a drop of olive oil and place in the roughly chopped chorizo. Once you hear the chorizo start to sizzle turn the heat down low and fry for 5 minutes stirring occasionally. You want the fat in the chorizo to render which will be the base flavour to accompany the monkfish. Next, crush the garlic cloves and add to the pan. Once you see the garlic start to take on colour immediately add the kale and stir. Add a knob of butter and turn the heat up to medium to ensure the kale softens. Continue to fry for 3 minutes then reduce the heat to low and let it cook while you prepare the fish. Season the monkfish with sea salt and cracked black pepper and put the second pan on to a high heat. Once the pan starts to smoke add a drop of olive oil and lay the fish in the pan. The pan needs to be hot enough to caramalise the fish adding flavour and giving colour. Cook each side for 3 minutes until just about firm. I cooked the tail with the fish's back bone still attached which kept the flesh excellently moist. During the last minute of cooking add a knob of butter and continually baste the fish. Once cooked remove and set on a piece of kitchen paper while you quickly sear the baby tomatoes and finish the kale. Add the cream and the juice of half a lemon to the kale and chorizo, when you see it start to bubble stir well and remove from the heat. For the tomatoes drain the majority of the fat from the pan you cooked the fish in, place back on the heat and add the quartered tomatoes. Fry on high heat for 1 minute then remove to a dish for serving.